For all home improvement and building projects planning is the one step that makes all the difference. Without good plans you will forget steps, run short on materials and even make expensive mistakes. This is especially true for green roofs because not only are there stringent structural requirements but the climate where you live is a very important factor that affects the survivability of the plants. 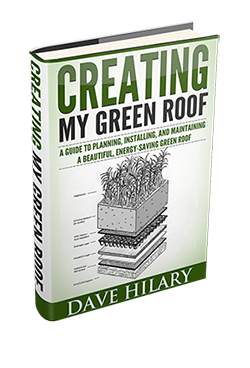 If you are retrofitting an existing roof there are basically two ways you can approach the design of your green roof. You can assess the structure and make the design fit its current, or improved load bearing capability, or you can fit the roof to the green roof you want. In most cases the first option will cost less and take less time while the second option will give you exactly what you want, cost more and take more time. You might however be in the enviable position of being able to design your green roof as part of the initial construction. In that case you can get exactly what you want, within the limitations of the rest of the building’s design, at a more reasonable cost. If you are in this category you can skip to Select a Type. You have to know how much weight your roof can support. An architect or structural engineer can assess how your building was constructed and let you know not only how much weight your roof will carry, but also how you can reinforce it so it will handle a heavier load. This step is largely based on the results of the structural assessment. 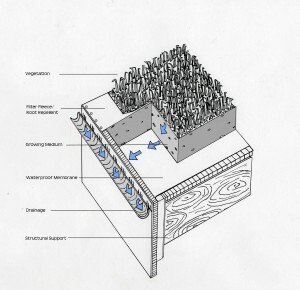 Most residential buildings will be best suited to an extensive green roof. This roof type uses just a few inches of growing medium and shallow-rooted plants making it the lightest of all green roofs. Most existing roofs will still require some modifications to support this type of green roof. New construction extensive roofs can be designed for the load. If you prefer to have a wide range of plants that require a growing medium from 8 inches too 4 feet or more, then you will be choosing an intensive green roof. For existing residential roofs there will be major renovations needed, but if the roof is done in conjunction with other remodeling efforts where it will be modified anyway, then this becomes more affordable. New construction residential roofs can be designed and built to handle these loads. Many commercial and institutional roofs will support an intensive green roof with only minor modifications. The plants you select have to be well suited to your climate so you should consult the United States Department of Agriculture’s Plant Hardiness Zone Map to find out what zone you are in. Once you know your zone you can select plants that fit it and that fit the growing medium you are using. In most places in the U.S. you will use plants in the Sedum, Delosperma and Sempervivum genera for extensive roofs. The sky’s the limit when it comes to plant types used on intensive roofs because you match the depth of the growing medium to the plant type. Local nurseries can help you make wise selections and landscape architects will also greatly simplify this step. Finally, you will draw up a landscape design that shows the placement of the plants on the roof. For extensive roofs this is rudimentary since you are dealing with a limited range of plants that all have similar habits and needs. The main considerations will be to consider the textures and colors of the plants at different times of the year. By mixing the varieties you can avoid having parts of the roof appear to be blank, or brown, while other parts are colorful. If you are designing an intensive green roof then you will follow a process like making a landscape plan where plants are grouped according to their aesthetic properties, functions and water and light needs. Finally, you can read more about selecting green roof plants and maintaining your rooftop garden at the links above. Residential green roof approximately 12 by 12 placed on The flat section of my ranch home in lafayette Ca. Can you help or are you able to direct me to qualified contractors?